Classic. Elegant. 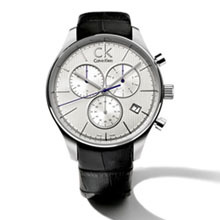 Introducing ck gravitation. Inspired by the detail and precision of a compass and the distinction of watches created in the early 20th century. The oversized silver dial is completed with a big seconds hand in blue. Completed with sapphire glass, this Swiss made timepiece displays hours, minutes, and seconds (as well as chronograph functions in the corresponding watch) and is enclosed in a brushed and polished stainless steel case. The thick masculine strap is offered in black or brown leather with buckle closure. Available in men’s gent and chrono size.